Breckenridge  is a ski resort and town at the northern tip of the south central region of Colorado, in the Rocky Mountains of the United States of America. It is the prototype of the Western Slope resort cities that have developed following the explosive growth of the ski industry in Colorado. International and Domestic flights arrive at Denver International Airport(DEN) 104 miles (166km) to the east. Domestic and local flights come into the closer Eagle County Regional Airport(EGE), 63 miles (102km), and Colorado Springs Airport(COS) 110 miles (178km). Numerous bus and shuttles are available from Denver International Airport. Breckenridge is located off Highway 9. From Denver and areas East, take Interstate 70 west to exit 203. Continue south on HWY 9 to Breckenridge. From Vail and areas West, take Interstate 70 east to exit 203. Continue south on HWY 9 to Breckenridge. From Fairplay and areas South, take HWY 9 north over Hoosier Pass to Breckenridge. Motion Rent A Car, +1 970 376-4885, . Provides car rental delivery to Breckenridge and Denver International Airport. Breckenridge Free Ride, +1 970 547-3140, shuttle stops at the Ice Rink, City Market, Recreation Center, Village and Four O’ Clock Roads, Columbine and Broken Lance Drive and Peak 9. Provides transport between the free carparks. Summit Stage, +1 970 668-0999, . Provides Free Bus Service throughout Summit County. Check Website for current schedules. Peak 1 Express, +1 970 724-7241, . Provides shuttle service between Breckenridge and Denver International Airport. Historic Father Dyer Church, . Established in 1880, the stain glass window of Father Dyer Skiing is worth a look. All are welcome. Breckenridge Ski Resort, . Skiing, snowboarding and Telemark. Goodtimes Adventures, . Snowmobiling, snowshoeing and dog sledding. 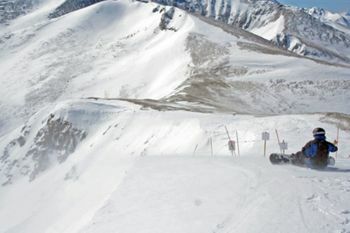 Breckenridge Snowmobiling Tours & Rentals, . Offers both Guided and Self-Guided Breckenridge Snowmobile Tours and Rentals. Ice Fishing on Lake Dillon. Kingdom of Breckenridge Stables, . Summit Huts Association, . Hut trips. Breckenridge Ice Arena(Indoor and Outdoor), . Avalanche Sports (Bike Rentals), . Breckenridge Outfitters (fly fishing), . There are many places in Breckenridge where you can rent all kinds ski and snowboard equipment. Just walking down Main street you will pass many. Your accommodation may also offer equipment or have discounts at certain stores. If you are not arriving by car it is often easier to rent your gear close to your hotel or even better close to the lifts as most offer over night storage. This save you the hassle of lugging your skis back to your accommodation each day. Downstairs At Eric's, 111 South Main Street, (970)453-1401 . Mi Casa Mexican Restaurant and Cantina, 600 South Park Avenue, (970)453-2071 . Ullr's Sports Grill, 505 S Main St, (970)547-5950 . Visit Colorado's Wine Country. Northwestern Colorado is home to over 70 wineries and its own indigenous vineyards. Wine lovers can enjoy several scenic day trips from Breckenridge to many of the small towns that grow their own grapes. These lovely little communities include Montrose, Palisade, Paonia, Hotchkiss, as well as the city of Grand Junction. This page was last edited on 20 June 2017, at 02:15.